If you are construction professionals, you may know that the word Oscillating is a smart form of Power Tools. However, oscillating multi-tools either corded or cordless is like a workhorse that allows you to handle a board range of tasks quietly and competently. Moreover, if you are a construction/carpentry professionals or Do-It-Yourself amateurs, Rockwell RK5132K 3.5 Amp Sonicrafter F30 Oscillating Multi-Tool will be the best oscillating tool for you. You can easily found the truthfulness of the above statement if you see the Rockwell Sonicrafter F30, during introduction they combine power and technological innovation in it. 3.5 Amps is one of the most powerful motors in its class, and 4° oscillating angel with constant speed control is unique. In our Rockwell oscillating tool review, we discuss more features on this incredible product. Moreover, we will get an overview of Rockwell F30 vs. F50, and other models in our comparison table below. If you often need to work in a poky space, you need such a tool that is tiny to maneuver, powerful enough to get the job done swiftly, and light enough, so it doesn’t tire you out. Rockwell 3.5 Amp Oscillating Tool Kit is just like that. It designed Rockwell F30 with a powerful 3.5 amp motor which housed inside an 11.3-inch body weighing only 2.9 pounds. The manufacturer usually designs multi-tools with an angle between 2.8 to 3.2 degrees. However, in our earlier review, we found that the top oscillating tool brand DEWALT using 1.6 degrees in their DWE315K model while Rockwell starts with 4 degrees and up in their multi-tools. Rockwell Sonicrafter comes up with a 4-degree match with it 3.5 Amp motor for more aggressive cuts. There is a common consequence that increased vibration along with the escalation of the degree of oscillation, but Rockwell multi-tool handles it correctly. Rockwell RK5132K introduce trademarked Hyperlock Blade Changing System which is easy to use and provides a one-ton clamping force to forfend slippage run in high speed. To change blades and other attachments quickly, you have to pull up the lever on the top of the tool. The bar, in the pulled-up position, acts as a hand crank that you’ll revolve to unscrew the bolt that clamps the blade in place. The Hyperlock Tool-free system works pretty well, it makes the task of blade change so easy and enhances the security by keeping everything gets locked into place. Rockwell power tools engineered with constant speed control to maintain a speed-of-cut under heavy load without halting or binding. To control the speed, it comes up with a variable speed dial which helps to bring optimal results on various materials and especially crucial for sanding and scraping operations. Vibration during operation will not bring a good result during sanding or cutting something. Rockwell company understand it very well and introduce Low-vibration counterweight to offset shaking so that you can get a smoother cut every time. It also designs its handle ergonomically that is not narrow enough nor over fatty which better to resist the shock during use along with comfortable grip. Those days are gone when to change blades or fixtures you have to visit a branded shop only. To reduce the stress of users Rockwell Sonicrafter host the Universal Fit System which accepts all blades, sanders, and other accessories from significant brands without the need for an adapter. Furthermore, Rockwell has blueprint their blade and attachments in such a way that it will be well-matched with other multi-tools. Hence, no matter what brand of oscillators you have, you can change the blades and fittings with the Rockwell ones without worry. 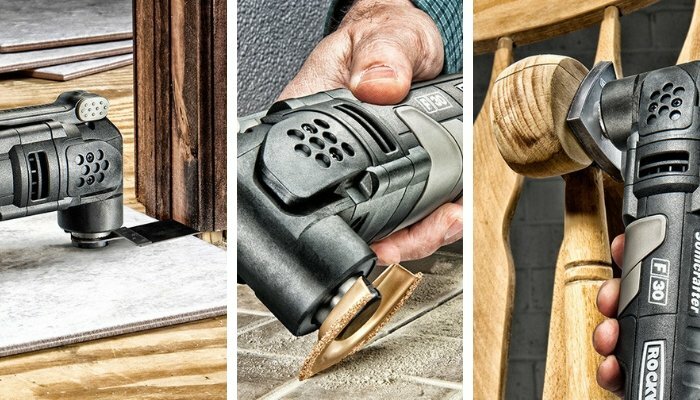 In our Rockwell oscillating tool review, we see lots of technological improvisation some of which are unique in the multi-tools sector. Zero QuitTM tools is another addition to those. It means that the Rockwell built with robust components that guarantee every machine performs up to your extreme expectations even on the hardest jobs, in the most demanding locations. In the case of maximum cutting load, the rockwell f30 performed well above the competition with a surprising 30 pounds of force behind its cut. With the all-new rockwell sonicrafter f30 parts, you can push harder & cut faster. The Rockwell rk5132k includes 32-pieces accessories chuck full of a variety of blades and sanding attachments to handle any of your projects. The list of parts and accessories are – one piece Sanding pad - RW8938, 26-pieces Sanding sheets - RW9145, three-piece 1-1/8" Standard wood end cut blade - RW8933, one Rigid scraper blade - RW8921, and one Rockwell carrying bag. Q: Does it come with a depth control gauge? A: No, it does not have any depth gauge with it. Q: What is the maximum oscillation speed of Rockwell f30? A: the maximum speed of oscillation is 20000 opm. Q: Does it includes a cord for its corded sonicrafter f30? A: Yes, it includes a 10 feet long cord with it. Q: From where one can buy or order different sanding pads for Rockwell multi-tool? A: You can buy sanding pads or any other accessories of Rockwell from your nearer hardware shop or an online marketplace like amazon.com. The universal fit allows you to use any branded parts on it. Rockwell RK5132K 3.5 Amp Sonicrafter F30 Oscillating Multi-Tool received lots of positive feedback due to its super performance and reliable quality. It’s a combination of durability and power which makes it a fantastic multi-tool in its class. You can omit the minor cons with its unique technological innovation which makes it easy to use for a long time and various purposes. Rockwell f30 is a perfect match for professions or DIYer. To purchase this fantastic device, please click here to check today’s price.